At Interplastica, Greiner Extrusion is attracting attention with its next-generation machinery and tooling: the RED.LINE System. 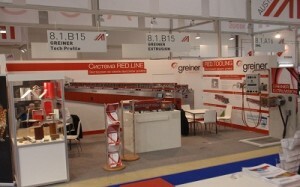 From January 29 through February 1, 2013, at Interplastica in Moscow, Greiner Extrusion demonstrated a new standard in profile extrusion. The RED.LINE System has been drawing interest through its wide array of extraordinary features that result in a substantial reduction in the consumption of materials and energy. At the Greiner Extrusion and Greiner Tech.Profile booths, a large number of visitors were witness to these benefits in person, as the RED.TOOLING dry calibration system with its PDC tank, and die with heater cage and flow.control, were presented at the exhibition stand. Moscow, Nussbach, 20 February 2013 – Energy efficiency, economical use of resources and high rentability are the most essential factors in modern profile extrusion. Greiner Extrusion’s RED.TOOLING System offers all these important benefits at an unprecedented, unparalleled level. The system is optimally precision-tuned composed of the RED.LINE (downstream) and RED.TOOLING (tooling) components. “The primary goal of our recent development was to provide customers with a significantly improved alternative to existing systems,” says Michael Schleiss, CEO of Greiner Tool.Tec. As a result of reorganization within the Greiner Tool.Tec Group, the company’ capabilities have become more centralized. The divisions below operate under the umbrella of Greiner Tool.Tec – with Greiner Extrusion (GET) in the “window” sector (window profiles), and Greiner Tech.Profile (GTP) in the “non-window” sector (cable ducts, roof gutters, profiles for the electrical, construction and automotive industries, and natural fiber composites. This clear positioning allows for a more intensive and concentrated effort in targeting individual markets with potential in regards to synergies and growth being effectively maximized. An additional highlight in the presentation by Greiner Extrusion and Greiner Tech.Profile in Moscow was the featuring of the “FX-Line” modular machinery system. This machinery concept offers impressive quality through extras such as GESS (the Greiner Energy Saving System) where both the parts coming into contact with water as well as the vacuum pump regulators that eliminate the need for “false air” are made of non-corrosive materials. Customer interest also focused on the highly economical generation of energy-saving extrusion downstreams. Feedback after the trade show confirmed the successful positioning of Greiner Tool.Tec divisions as being of considerably high value in the marketplace. Greiner Extrusion is a subsidiary of Greiner Tool.Tec, and an integral part of Greiner Group. During the past 30 years, consistency and innovative thinking have made Greiner Extrusion the worldwide leader in toolings and machinery for plastic profile extrusion, and in designing complete manufacturing facilities for the production of plastic window profiles. Most major window profile extruders utilize toolings from Greiner Extrusion for their production. Greiner Tool.Tec is based at Nussbach, Upper Austria, and has 14 locations throughout the world. In 2011, the company achieved an annual sales volume of €74 million with a workforce of 819 employees.